Bears huge crops of gorgeous English cucumbers. This Burpee bred cucumber is proven tops for productivity, flavor and wide adaptability. It bears huge crops of gorgeous cukes. Harvest starts early and keeps on producing for many weeks. Dark green fruits are 8 1/2" by 2" with crisp, juicy flesh. Plants are powdery mildew and Cucumber mosaic virus tolerant. For perfect cukes, grow them on a fence or our space-saving Trellis Netting. Sow seeds 6" apart in rows, or plant 5 or 6 seeds in groups (hills) 4-5' apart. Grow cucumbers in containers on your deck, porch or patio! Direct sowing is recommended, but to get a head start you can grow cucumbers indoors 3-4 weeks before the last frost in individual biodegradable pots indoors. Sow 2-3 seeds per pot. Thin to one plant per pot. Sow in directly in the garden in fertile, warm soil after danger of frost has passed. Cucumber seeds will not germinate in soil colder than 60 degrees. Sow seeds 3 inches apart in groups of 4-6. Cover with 1 inch of fine soil. Space groups 19 to 26 inches apart each way. Thin to 3 or 4 strongest seedlings in each group when they are 1-2 inches high. Cucumbers have a shallow root system, mulches help retain soil moisture and maintain even soil temperatures. Do not move the vines, they are easily injured. When cucumber seeds are direct-sown along a cucumber fence, vines can be trained to grow upright for easy picking and to save space for other plants to grow. Good companion vegetable plants are direct-sown radishes, bush snap beans, and transplants of compact herbs, peppers, eggplants and tomatoes. Attract bee pollinators by planting daisies such as sunflowers, cosmos, zinnias and coneflower, and mints such as bee balm, sage, oregano and lavender. More bees mean more chances flowers will be pollinated and develop into fruits. Like most vegetables, cucumbers are tender and tastiest when harvested young before their seeds are fully developed. Slicing cucumber varieties are generally ready for harvest when about six to eight inches long; pickling cucumber types at three to five inches- both in about 50-60 days from seeding. Don't allow the fruits to become overripe on the vine as this signals to the plant that the seed-development process is nearly complete and it will shut down. Keep mature cucumber fruits picked to encourage further production. During hot weather cucumbers grow very fast, you may need to harvest every day. Harvest the cucumber fruits early in the morning before the sun hits them for the best flavor and texture. Cucumber, Early Pride Hybrid is rated 4.6 out of 5 by 9. Rated 5 out of 5 by cassielee19 from Best cucumbers! This is by far the best cucumber variety I have ever planted. I got hundreds of cucumbers just from 3 plants and they were all beautiful. I accidentally let some get bigger than I like and even those ones were still good and didn't get ruined with huge seeds. My Dad thought that I had to have used fertilizer because I got so many cucumbers, but I didn't use a thing on them! He's been growing cucumbers for decades and has never seen anything like these. I also used a trellis for the first time for cucumbers this year, I don't know if that had any help in how many I got, but I will be sure to do everything the same next year and hopefully get the same results. Rated 5 out of 5 by Nancygeek from Tasty, crisp, large yields! Planted these in a raised bed and grew upright on a trellis. Slow to get going but when they did I was harvesting 5-6 cukes a day from 4 plants. Straight, uniform fruits with small seeds, very crisp and never bitter. Still producing cukes despite losing a lot of leaves to disease. Will plant these again for sure! Rated 5 out of 5 by City Gardner from Best Ever! Tried this cucumber for the first time about 5 years ago....BEST we have ever had! Great flavor and almost no seeds if picked just right. Very productive...we have 5 plants and get 5-6 cucumbers every day for several weeks. We have enough to share with neighbors and they make great sweet sandwich pickles as well. We love them! Rated 5 out of 5 by Brutus from Really Good Cuke First year growing these and we love them. Germination rate was around 90%. The plant are strong and vigorous and took right to our trellises. No disease problems at all. The cukes grow very slowly when they first set, but then look out - these plants are heavy producers when they get going. The cukes have a nice dark green skin and the seeds are quite small, even when the cukes reach 12" long. The flavor is very mild and we haven't had a bitter one yet, even when they got a little too big. They also last a long time in the fridge, even after they've been cut. Will definitely grow again next year. Rated 5 out of 5 by Crackergirl from Amazing Cucumbers This is the second year we have planted this type of cucumber. We have picked over 450 cucumbers in a little over a month. They are record producers and are so sweet and crisp. They also do well in sandy soil and dry and hot weather. Will be sure to use this type from now on. Rated 5 out of 5 by Trevor from The Wonderful Early Pride Hybrid This is the best cucumber plant I have ever used! It definately gets the highest rating available. The plants produce faster when you grow them without any pampering, just water them a bunch and give them something to vine on. Super speedy growth caught me off gaurd and I had to rearrange some other vegies to give the cukes something to lean on. Give them space! 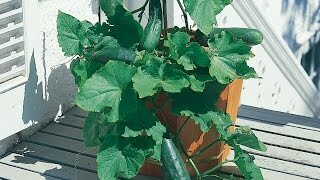 For some reason, this hybrid feeds alot quicker than my other cukes, and I recommend you don't keep them confined to one little patch of garden, though I'm pretty sure they would grow just as good. I have them in every garden in my yard. The best thing to wake up to is a fresh, tender cuke from the garden.